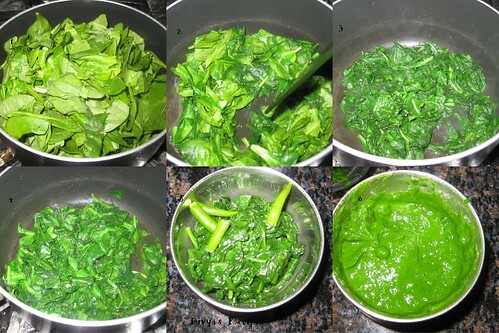 Saute the spinach leaves,little till the reduce in volume ( for a minute or two). 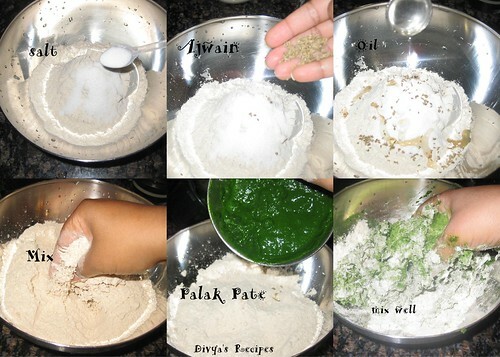 Take the flour and add salt,oil,ajwain to it this ground spinach and make to a smooth dought,as we make for pooris. (add water little as needed). 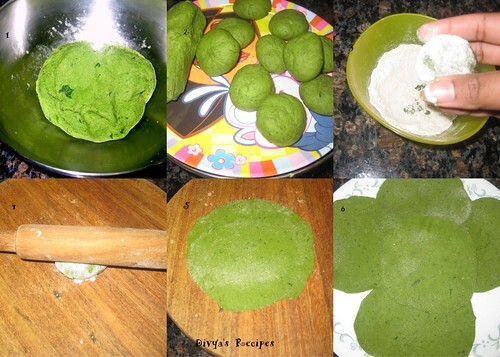 Make small balls and roll into pooris as we for the ordinary pooris. Colourful poori! I have never tried making these..looks good! 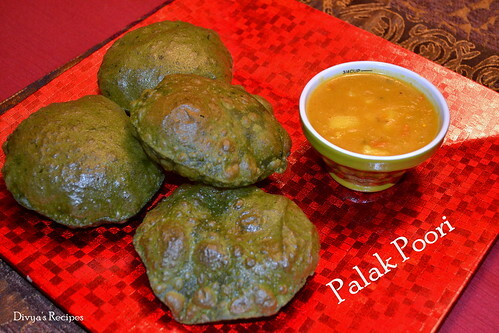 Poori with palak looks very nice Divya. Colorful and attractive dish! wow..so perfectly puffed pooris...inviting pics! wow what a coincident just posted them last week in my site.pretty looking puri.love the taste right??? Look at those fluffy puris. I've never tried these but up to trying something new! very cute and attractive puffy pooris,my fav. The pooris look amazing. Have never made these. Divya, how would you compare this to the normal one's? Are they less oil/ more oily? 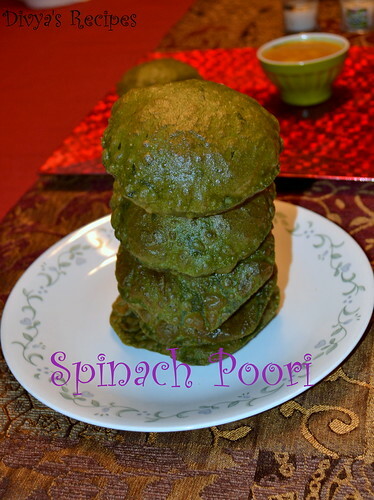 I wonder how they would be if we did not 'cook' the spinach first? 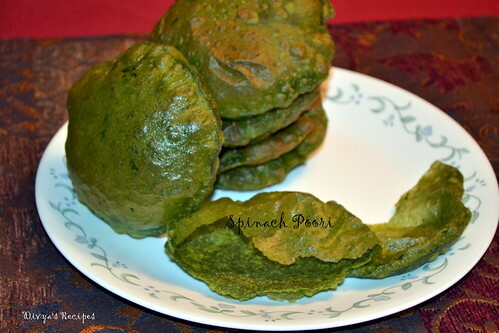 nicely puffed up greeny pooris,yummy!! So soft and colourful pooris!! OMG! the poories are standing like a towe..it shows how much crispier they are! 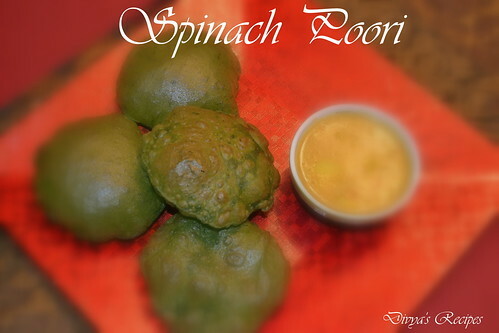 love its color.. nice recipe..
Love the dark green textures and so healthy too. 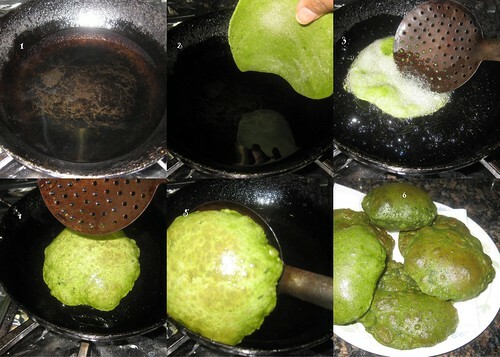 Yummy and nice poori..nice colour..
What a colour! Wow! Looks yumm..
My aunt amde these for us several years ago..and i had forgotten about them until I found your post..they look so del!